Hey there, ladies and gents! This week, I’ll be covering Vanish, a survival horror game created by 3DrunkMen. As an added bonus, I’ve also included a gameplay video. It’s a new thing I’m trying now that I’ve a twitch channel set up. I figure it’ll augment what I’m saying here – after all, it’s one thing to hear me babble on about a game, and another altogether to actually see me play it. Warning: this installment contains strong language. Anyway, let’s talk about Vanish. You wake up in front of a massive, sealed iron door. In front of you, you can see a set of iron bars which appear to have been forcibly torn open towards the bottom. The area is lit only by two searchlights; beyond is nothing more than a labyrinthine expanse of brick-and-mortar tunnels. Who you are, where you are, and why you’re there don’t really come up – your character can’t really seem to remember. Thus, there’s only one way to go – forward, in hopes that you can find your way out of this hellhole (or at least figure out why you’re here). 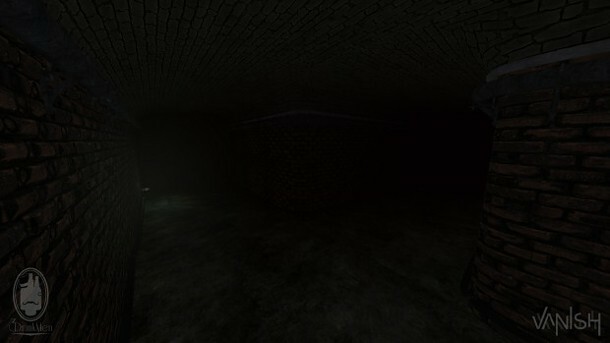 As you fumble your way along the dark passages, you’ll find notes left by the guys who (were) working down there. Who you are, where you are, and why you’re there don’t really come up – your character can’t really seem to remember. Full disclosure: Hank is a terrible person who likely has a drinking problem and everything bad that’s happened in these tunnels is probably his fault in some way. Anyway, in case you hadn’t guessed yet, Vanish is a game designed in the spirit of Slender and its ilk. As you scamper frantically through the stench-filled tunnel system, a creature that looks like a plague doctor caught in Chernobyl will be stalking you through the tunnels, trying to bring you to an untimely end. Stopping to think about it, there may be more than one of this thing stalking about through the undergound. That, or the one can teleport. I’m not really sure which is more unnerving. Additionally, Vanish makes very light use of scripted events. Most of the time, where and when the creature appears is entirely random. It might be directly in front of you as you turn a corner. It might be in the opposite direction of where you need to go, or it might just be standing at the only way forward from a dead-end. That’s distressing enough without factoring in the fact that you only have one life. See, there are no save points or checkpoints in Vanish that I’m aware of – get caught even once, and you’re back at square one. Factor in that the tunnels appear to constantly warp and shift positions and that nothing seems to stay in one place between playthroughs (or maybe I just have a horrific sense of direction), and Vanish becomes a tense, anxious, and desperate affair. Vanish might still be in alpha at the moment, but it’s already a promising game, and more frightening than the majority of titles that call themselves ‘horror’ these days. Pick it up on IndieDB if you want to give it a try – it’s free.